For many years one of the major headaches facing NATO in Europe were Soviet mobile tactical missiles. Starting in the late 1950s the Soviets fielded “tactical” (division level) and “operational-tactical” (army and force grouping/front level) missiles capable of delivering nuclear weapons. The best known of these were the “Luna” (FROG 2/3/4/5) and “Luna-M” (FROG-7) battlefield heavy rockets and the 9K72 “Ehl’brus” (SS-1c SCUD B) operational-tactical missiles. The former came three or four to a battalion and had a maximum delivery range of 70 kilometers with the FROG-7. The latter came in brigades of 9 to 12 (later 18 and even 27 at force grouping/front level) and had a maximum delivery range of 300 kilometers. Both could deliver point nuclear weapons (10 kilotons) or area nuclear weapons (100, 200, 300 and later 500 kilotons for the SCUD B) deep into NATO rear areas. But accuracy was not great, and in the case of the SCUD B it took about an hour once a target was selected and the launcher moved into position before it could fire. NATO had figured out ways to locate them, as doctrine required they be no more than 1/3 of their maximum range back from the line of contact. Both factors impacted Soviet thinking and planning for their use. In 1980 the situation changed when the Soviets began to field the 9K79 “Tochka” (SS-21 SCARAB) guided missile system into GSFG opposite the US forces in Germany. Unlike the first two – the FROG-7 relied on spin for accuracy and the SCUD B, whose guidance was based on the V-2, only had guidance for up to 68 seconds of its flight path – the Tochka used aerodynamic “paddles” for guidance throughout its entire flight path. Accuracy was cited as from 10 to 30 meters with a maximum miss of no more than 150 meters. The Tochka initially offered a range of 90 kilometers – more than the FROG-7, but still it meant that the missiles had to be only about 30 kilometers behind the lines. Later they increased this to 120 and perhaps 150 kilometers, but it still was only a tactical missile. In 1987 NATO intelligence detected that the 11th Army Missile Brigade of the 8th Guards Army, GSFG, had quietly reequipped with the new 9K714 “Oka” (SS-23 SPIDER) operational-tactical missile. Designed by the same design bureau that created the Tochka (KBM under S.P. Nepobednimyy) it was essentially a Tochka “on steroids” as it was the same design but larger. This missile had two nuclear payloads as well – AA-60 and AA-75, which were probably the 10 and 200 kiloton yield weapons, an improved conventional munition (“cluster”) warhead option, and a unitary HE warhead; throw weight was about 450 kilograms or about the same as the Tochka. But the Oka could range 400 to 500 kilometers depending on the warhead used, which meant it could sit about 130-170 kilometers back from the front and be relatively invulnerable to detection and counterattack. The three battalion/four launcher structure of the brigade was changed to four battalions of four launchers each or a brigade of 16. But before other armies could receive the new missiles, Mikhail Gorbachev offered to remove and scrap them as part of the theater missile treaty in 1987. The launchers were soon withdrawn but later the Soviets had to admit they had provided four to six launchers each to the CSSR, GDR, and Bulgaria along with 120 missiles. These were also later scrapped. One museum example each is known to exist in Russia and the Czech Republic. 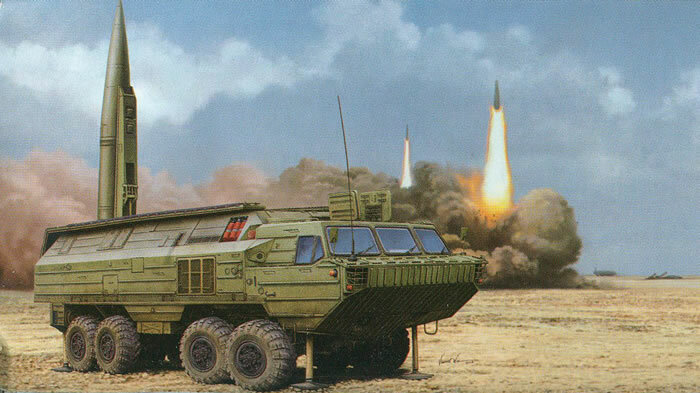 The Oka is very similar in design to the Tochka, but it uses a much larger BAZ-6944 four axle amphibious launcher than the smaller BAZ-5921 three-axle launcher based on the 9A33 “Osa” (SA-8 GECKO) vehicle. Both missiles use guidance “paddles” that are used to control airflow and divert the missile onto its proper course. But unlike the SCUD B which needed a crew of seven the Oka can be launched by a crew of three in the cab. HobbyBoss has now released a totally new kit of the Oka and it is quite impressive. The model comes with a complete interior in the cab and the missile bay and a nicely done missile. It even includes the heating shroud for the warhead which is necessary with the nuclear warhead options. The bay doors are hinged and snap in place, and the launch arm elevates. Based on photos that I have seen, I suspect a lot of the wiring and hydraulic tubing inside the missile bay is missing and modelers who want to super-detail this missile seek out a source for reference. But from what I can see what is provided is quite accurate, so that part is good to go. Be prepared for the fact this is a big model – 330+ mm or over 13" long, so it will take some planning to build. Step 1 covers the cab interior, and the only decals provided in the kit are for the instrument panel and the computer screen for the vehicle commander (part C6). Step 2 continues with the missile checkout equipment at the rear of the cab and the cab interior windows and external hatches. Steps 3 and 4 cover the hydrojets for water propulsion. The suspension begins in Step 6. While the tires are vinyl they did not appear to have massive seams but a bit of sanding/trimming will give them a more “used” look. The suspension on this vehicle is exposed as the chassis is underneath the hull and not inside it like with the Tochka launcher. As a result there are a lot of parts used to assemble the eight axle and suspension fittings. The parts are all very similar in appearance so I suggest taking your time and not removing all of them from the sprues at once. In Step 14 you are given an option on the jacks; there are four with the vehicle and in the case of the preserved vehicles they show the launcher completely off the ground when the jacks are used. If not, the jack plates (parts B20) simply cement to the bottom of the lower hull. Step 15 is rather tedious, as you have to make a large number (up to 48) etched metal brackets which appear to go with a storage tarpaulin and need a small length of copper wire (or sprue or rod) inserted in them. Step 16 covers the missile itself; if you want the missile ready for launch the four guidance “paddles” (parts B38 and PE brackets) should be mounted at 90 degrees to the missile airframe; they are only folded when stored in the missile bay. In Step 19 the interior is assembled using the two side panels, details and the previously assembled missile bay and launch arm with missile. While as noted there are probably some hoses and wires that can be added here, realize that the Soviets tried to “soldier-proof” critical systems like this and did not leave a lot of bits around to use as “convenient” steps or handholds. Step 20 covers the rear upper hull and rear plate. The hinged parts A36 are work steps for the crew when ensuring the missile is ready to erect and open the paddles or fold them up for retraction. Step 21 is the heating shroud for the warhead, which may be left closed or open for missile launch. The big bay doors come in Steps 22 and 23, and are pretty straightforward. The rest of the steps 24-27 are final assembly of all of the components. There are no decals for the outside of the launcher (“bort” numbers or other markings) and two variations are offered: overall Soviet Khaki #2 or a khaki/grey scheme. Since the launchers were just starting to enter service they did not have much of a chance to get fully integrated into their new units. As of this writing there have not been any photos of the Oka in service that have been published, only those in museums or awaiting destruction. (A probable scheme for the 11th Missile Brigade should have been something like 111, 112, 121, 122, 231, 232, 241, 242, 351, 352, 361, 362, 471, 472, 481 and 482 had they been so marked). Overall this is a gorgeous kit of a very short-lived piece of Cold War history, but in the next year we are also promised new kits of the 9K79 Tochka and 9K72 Ehl’brus so a good year for short-range missile fans! Thanks to Wes from the Bel Air Hobby Works for ordering the kit for me.